Cake & Heels: Shake Shack!! When I was in high school I always wanted to work. Every summer my friends would get jobs, earn paychecks and have extra spending cash on top of their allowances. My parents on the other hand thought that my time was best served by going to summer camps, studying & in general expanding my knowledge of the world. What they didn't consider was the possibility of a long-term love affair with gourmet food & all the knowledge that could have come from working a 9-5 at a restaurant or the like. Enter Sophomore college summer, when my pre-arranged internship to work on the Macy's 4th of July Fireworks spectacular was canceled at the last minute due to my "boss" getting fired. Talk about bad timing. Instead, I found myself with a free summer in New York City. What to do? My friend mentioned this new hot dog stand that was opening in the middle of Madison Square Park & was currently hiring. Finally, my lifelong dream of being a short order cook was coming to fruition. Little did I know that this was the beginning of a burger revolution in New York City. Danny Meyer, a well known and extremely respected restaurateur, had won the bid, mostly due to his interest in preservation and rehabilitation of both Union & Madison Square Park, and partially due to his 5 Zagat top 100 rated restaurants, to start a hot dog & hamburger stand in the middle of the coveted park space. He hired his then chef, Kerry Heffernan to design the menu & run the joint. 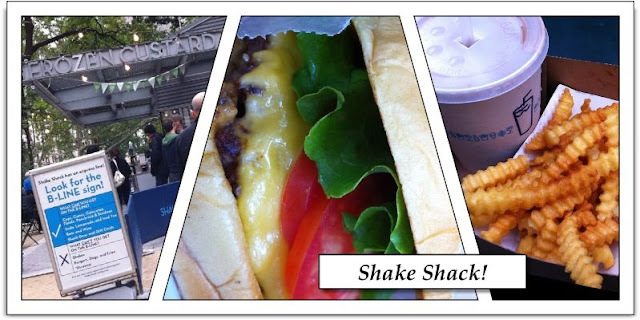 Shake Shack was born. I was in love. And so was the rest of the world. With lines stretching over 2 hours for a Shack Burger, Concrete & Fries, Mr. Meyer's had a star on his hands. But in a move that won my utmost respect, his insistence at maintaining a strong hold on expanding his chain, while still maintaining the same quality that was associated with the original kept him from letting this gem turn into another poorly franchised chain. That said. Now that Miami's getting a slice, when is it our turn out here in Cali to pit your burgers up against some of our greats? Thanks for cluing me in on this awesome eatery!